This months social will be hosting Professional Rock Climber, Audrey Sniezek. 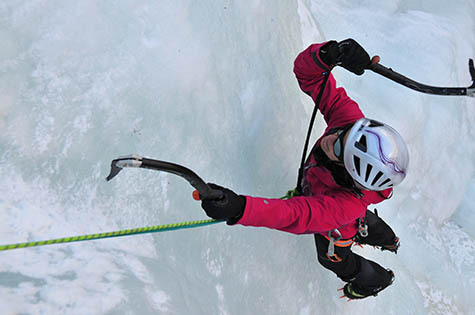 Join us as she shares stories of her first ice climbing adventure in Western China. The third Tuesday of every month Edgeworks will be hosting the American Alpine Clubs Monthly Social. Climbing starts at 06:00PM followed by drinks and entertainment at 07:00PM. Join us and find out what the AAC and Edgeworks are all about, meet other members, and have a great time! We have a limited amount of Summer Camp spots still available for August. Don't miss out on the fun! Contact us today to register. The Edgeworks Climbing Team wants to congratulate Kylee Beam for taking 16th at Nationals Competition in Atlanta!Job well done! We decided to remove the carpet in the lobby. This will give the gym a more modern feel. So please excuse the mess!!! Team Edgeworks would like to invite climbers and their families who are interested in joining Team to our preseason potluck dinner. Facebook or Yelp App and get $3 off a Day Pass. Offer ends Sept 1st 2013.